Being a self confessed kit-test junkie I jumped at the chance of playing with £2,500 worth of bespoke titanium road bike and can safely say I wasn’t disappointed. The Burls range of Ti frames are available in various configurations including, road, track, audax and mtb and either off the peg or totally bespoke with a choice of round, aero, ovalised and diamond tube profiles. Unlike his steel framesets, Burls' Ti frames are crafted in Russia- his wife; Mila is pivotal in this side of the business, ensuring they are built to the same exacting standards. Plain gauge 3AL/2.V tubes can be painted and Justin reluctantly offers this as an option with plain, single colours starting at £140. However, being the stuff of Russian submarines, which spend much of their lives immersed in salt water, the raw, brushed finish will laugh in the face of winter roads and is arguably prettiest and most practical in its natural state. Casting a critical eye over the test bike, the frameset is a subtle marriage of old and new with curved stays, horizontal top, aero down and integrated head tubes with quietly conservative 72.5 degree angles. Unlike aluminium, titanium is so strong it renders replaceable hangers unnecessary and can create alignment problems. Attention to detail is second to none, raw TIG welding and Breezer ends continuing the industrial beauty. 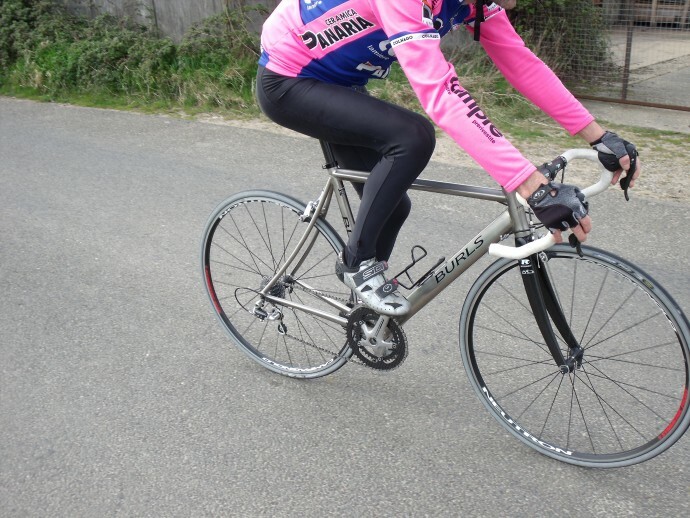 Our test bike weighed 17lb (less pedals) which is pretty impressive by anyone’s standards. Without wishing to resort to tired titanium clichés, from the first pedal strokes it’s clear you’re aboard something very special, the frame delivering an extremely supple ride over poor surfaces-converting road shock into ripples almost to the point where it feels soft in comparison to high quality steel tubesets. Turning the cranks in anger sees the tight rear triangle spring into life, feeling positively gazelle like on the climbs thanks in no small part to the Campagnolo Neutron wheelset topped off with Michelin pro race rubber wire ons comparable with the best tubulars. The classy tyres round off a wheel package that should suit rider's of all physiques and disciplines from century riding through to hilly TT courses thanks to aerodynamic profile, nominal spokes and excellent lateral stiffness. Hubs on the Campag Neutron wheelset are super smooth, and admittedly not something you’d whip on the winter workhorse but well suited to the rigours of racing in all weathers. Dependable descending comes courtesy of precision frame alignment, sensible 55cm top-tube and super stiff, proportionally wide, 44cm Reynolds bar and stem (production bikes will have Easton). Despite severe provocation, it couldn’t be cajoled into misbehaviour or the dreaded shimmy and the now discontinued Reynolds Ouzo pro forks with their expandable wedge prove that while carbon might be as cheap as the proverbial portion of chips, you still gets what you pays for. Town manners are surprisingly good and it trickles serenely through lines of stationary traffic, the low weight, powerful bakes and crisp handling allowing it to be flicked around opening car doors and bunny hopped over looming potholes with consummate ease and it positively soars away when the lights change. On the open road, bar height is spot on for racing and crouching low into fierce headwinds but not quite as supple as I once was, I prefer a fractionally taller front end and correspondingly shorter stem. In response to customer demand, even the bottle mounts are welded (as opposed to riveted) in position. Ti forks were an option but inconsistencies in supply coupled with Justin’s feeling that titanium’s qualities are best reserved for frames sees most customers go the carbon route. Shifts from the Centaur transmission are suitably slick but had a lighter action closer to that typified by Shimano. On the subject of groupsets, Justin prefers Campagnolo but doesn’t offer build menus per se reasoning consumers willing to spend this much are likely to have a very clear idea of what they want. However, the bike as tested with some substitutions (e.g. Easton forks, bars and Deda stem) would cost around £2,250 add another £50 for a full Ultegra grouppo. Ours sported carbon fibre rings, shaving a few grams but neither seem to offer much weight or mechanical advantage over aluminium options and rather smacked of carbon for carbon’s sake. Contact points are a deeply personal subject and while the bars were tailor made for me, Flyte saddles and I have never been terribly good companions and this perch was no different. The unbranded three-ply carbon post looks pretty and keeps weight low but is more ornamental than essential given titanium’s supple characteristics. If I was in the market for a top flight money’s no object race/TT/sunny days plaything the Burls would be a mighty serious contender as it’s a real charmer and full on race tool in equal measure.